Shabbat is a day of rest, reflection, and renewal. This weekly spread is offered to help us question: how do we want to shape our sacred time? Each Friday night, we invite you to light Shabbat candles with us and reflect on the state of the world and our responsibility to it as we read through the Hebrew alphabet and its wisdom. Let this practice support you in welcoming in the Sabbath as we collectively tend to and hold our care, questioning, and actions this week. This week, what came up or was present for us? What a difficult week. We’re on the 35th day of the government shutdown, temperatures are dropping below 0 degrees, the Supreme Court has passed a trans military ban, and confrontation erupted at the Indigenous Peoples March. That’s just the public news – there are also our daily struggles, both big and small. With so many things happening at once, it’s hard to catch a breath and process what we can do, let alone how we feel. Nun reminds us that there is possibility in faith, in the abundance we dream of, believe in, and deserve. This faith is backed by our own commitment. Nun opens the word navi for “prophet,” speaking divinity into humanity. This is a quality we can all develop. The time is now to learn how to lead with care and community. If you’ve got a belief, a vision, a future that will support people in struggle, step up. We can bring our prophecies into being. Let’s help pull each other out of despair and into hope together. This Sabbath, what nourishment do we need and what deserves our sacred time? Tzadi begins the words tzadik for “righteousness” and tzedakah for “charity.” This week, Modern Ritual contemplated how we might incorporate tzedakah into our lives to build a just society that affords everyone dignity. Sometimes it can be overwhelming to process all the need in our communities, let alone the world. I used to worry constantly about whether my money was going to the right place, where it could have the biggest impact. I got so lost in worrying, I stopped giving, afraid to waste it. In my attempt to return to tzedakah, I cut through all that I’d put on the practice of generosity and simplified it to one requirement: consistency. Maimonides asked that anyone who stays in a town for thirty days be obliged to contribute to public charity. So, every thirty days, I donate what I can that month, most often to people and organizations in my local community. I still have trouble letting go of this pull to weigh need, urgency, and resource. It’s not perfect, but I no longer want to place perfection over charity. I don’t want giving to become a transaction that requires a cost-benefit analysis. This Sabbath, think about the values you want to embody, reflect on your influence, and become the giver you’d like to be. Take stock of that which you have to give, be that money, but also time, care, and resources. Then, follow through come Monday. Moving towards this world to come, how do we hold our values and bring the ways we want to build into the next week? A mouth in motion, pei signifies the power of human speech. In the Kabbalah, it’s believed that whenever people speak, they send energy forth into the cosmos. Getting ready for our next week, what kind of energy do we want to call in and speak out? One energy we can invite is that of support. This energy asks us, in a world that tears us down each day, how can we build our communities up? We don’t have to engage our challenges alone; support is one of the most powerful things we can do for one another. In fact, we’re wired for it. Our nervous systems are not self-contained but rather attune and connect to each other. Tending these connections in our lives can support us in continued resistance and resilience. This week, make it a practice to talk up, love on, and care for the people in your life, especially the ones you usually see as strong. Check in, make room for feelings big and small, validate them. Tell each other, “I trust your decisions.” “You’re doing great.” “I believe you.” “I appreciate you.” “I value _____ about you.” Be honest and affirm, affirm, affirm. From our mouths, let our words bring sweet energy back into our cosmos. 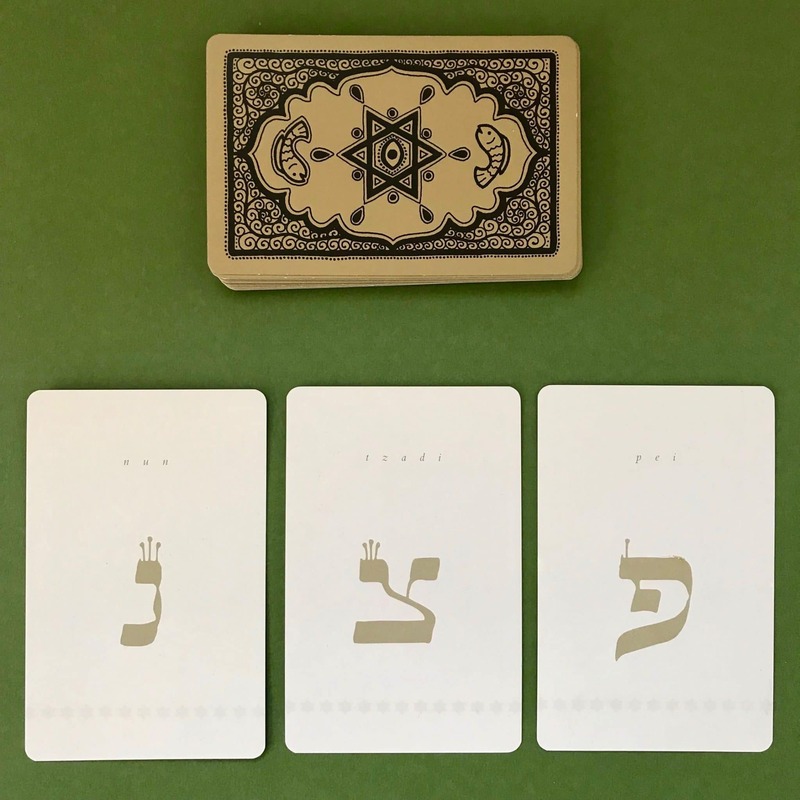 Let us know how this reading sits with you and what it’s asking you to bring into your life with the hashtag above. As always, take what you need from the cards and leave what you don’t. We’ll see you next week. Shabbat Shalom! Maya Sungold is a facilitator, farmer, and fiber artist who works through practices of cultivation and collaboration to support relationships in continued resistance and resilience. In spinning both fiber and web, they build change and creative adaptation, queer time and radical imaginings, tender accountability and perfectly possible contradiction into their art-making and community-building. Their work aims to shape space and structure for connection, reflection, and creation to resource us as we live into the world to come. You can connect with them on Instagram at @soulxstitch.